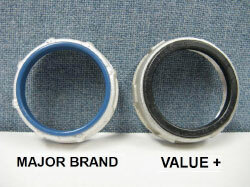 VALUE+ is a quality product line that is value priced to maximize your profits! Our line consists of USA branded malleable iron, aluminum, steel, copper, and die cast electrical construction fittings that are priced at 30% below major brand lines. 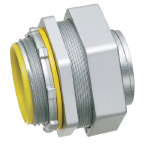 This industrial and commercial electrical construction product line includes conduit bodies and fittings, liquid tight connectors, strut fittings, enclosures, compression connectors and much more. 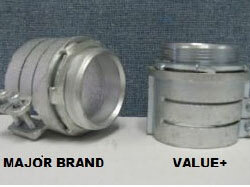 The quality of VALUE+ products meets or exceeds that of major brand equivalents. These items are direct equivalents to major product lines such as Appleton, OZ-G, Crouse-Hinds, Burndy, Unistrut, Hoffman and others. 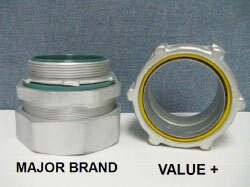 Value+ part numbers are universally descriptive for easy look up. 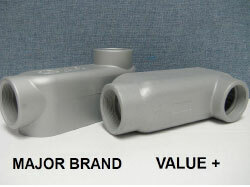 For example a 1” form 7 aluminum LB conduit body is numbered LB37SA, a 3” sealtite connector is numbered as ST300. We would be glad to cross reference and provide you with the Value+ part numbers needed. This is a great line to utilize when your customer’s needs are non-brand specific, it allows you to increase your profits while providing an excellent quality product. In addition, this entire line has been single plus marked for participation in our Plus Program!